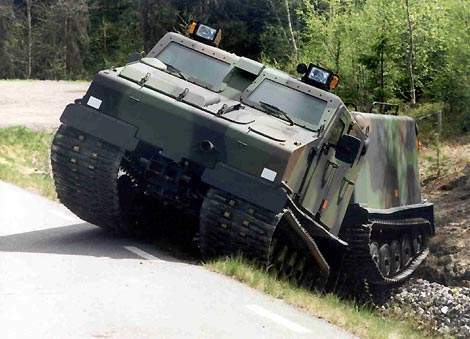 The Bv206S is an APC version of the tracked articulated all terrain vehicle. The Bv206S is quickly fully amphibious with a water speed up to 4.7km/h. The Bv206S can carry 12 combat equipped soldiers through difficult terrain and extreme weather conditions. The Bv206S can be armed with a ring mount for a 7.62mm or 12.7mm machine gun. The Bv206S is an armoured personnel carrier version of the tracked articulated all-terrain vehicle, Bv206, of which 11,000 have been produced and are operational in over 40 countries worldwide. The vehicle can carry 12 combat-equipped soldiers through difficult terrain and extreme weather conditions. The vehicle operates in temperatures from -32°C to +46°C, from Arctic to desert and jungle conditions. The vehicle provides high mobility and ballistic protection and is available as an armoured personnel carrier, cargo carrier, battlefield ambulance, mortar carrier, command post vehicle and recovery vehicle. 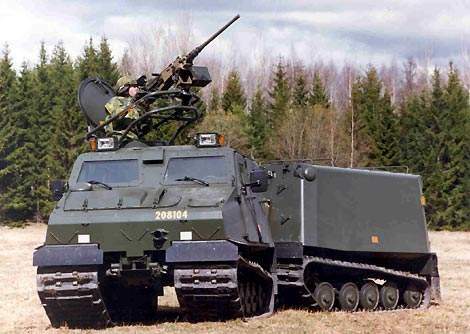 The Bv206S vehicle was developed jointly by Alvis Hagglunds (now BAE Systems Land Systems Hagglunds) and the Swedish Army Materiel Command, initially for use by the Swedish armed forces. It is in service with the armed forces of France, Germany, Spain, Italy and Sweden. The Bv206S is also under evaluation by other armies. Orders have been received for 479 Bv206S vehicles. 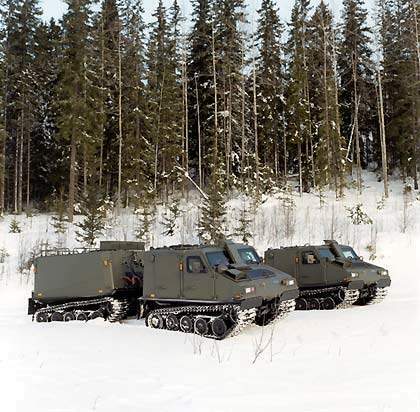 In March 2004, the Swedish Army placed an order for 15 more Bv206S vehicles (seven troop carriers, five cargo carriers and three ambulances). In June 2006, a follow-on order for 52 vehicles was placed. This brings total orders for Sweden to 93 vehicles. 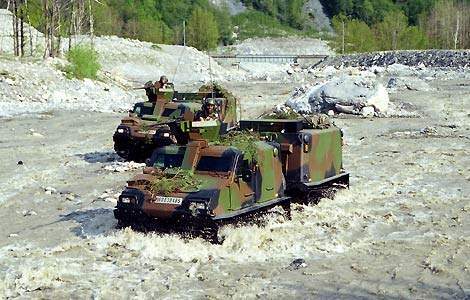 In October 2003, Land Systems Hagglunds received an order for 112 Bv206S all-terrain vehicles from the Italian Army. The vehicles are being delivered between 2004 and 2007. A further 34 were ordered in November 2003. The programme is currently planned to total 189 vehicles. 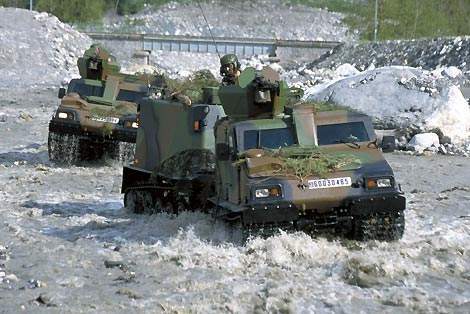 In 2002, Rheinmetall Landsysteme GmbH (as the contract authority) placed a production contract on Land Systems Hagglunds for 31 Bv206S vehicles with delivery into service by 2005. A further 75 were ordered in December 2004 and 81 in September 2005. The total Bv206S requirement for Germany is 200 vehicles. 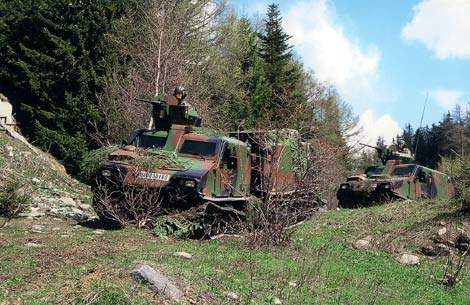 The Bv206S has been deployed in Kosovo by the French Army. 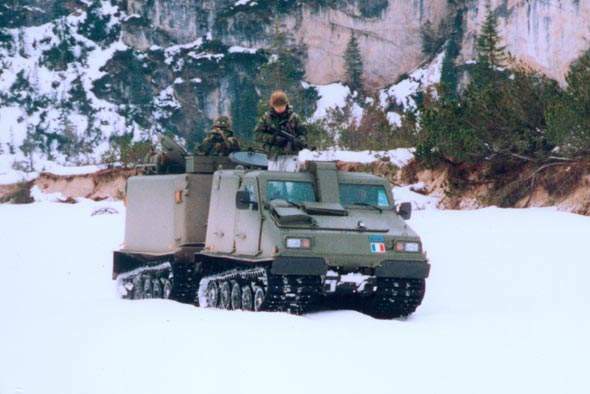 A number of the French vehicles ordered in September 1999 are fitted with a turret and an M2 12.7mm machine gun. 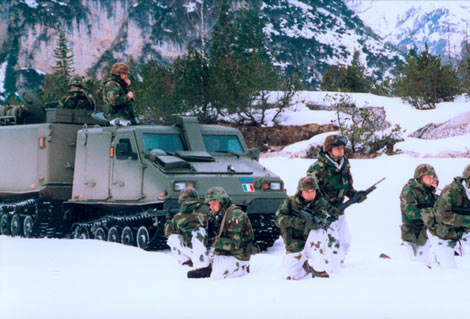 The forward car accommodates the driver and three combat troops. The rear car carries eight fully equipped troops. The vehicle is fitted with all-welded steel armour and the windows of the vehicle provide the same level of protection against direct fire 7.62mm ball ammunition and artillery shrapnel. The front and rear cars are fitted with roof hatches. The vehicle is air-conditioned and can be fitted with nuclear, biological and chemical warfare protection and an automated fire detection and extinguishing system. Soucy International, of Quebec Canada, has been awarded a contract by Land Systems Hagglunds to supply the Soucy rubber track system for the Bv206S. The system is also fitted to the Viking (BvS 10) vehicles, in production for the UK Royal Marines. The Bv206S can be equipped with a ring mount for a 7.62mm or a 12.7mm machine gun. Missiles and other weapon systems can be carried in the vehicle. A mortar carrier variant of the vehicle is available. The engine and transmission are installed in the front cabin. The Steyr M16 six-cylinder in-line, 3,200cc, direct injection diesel engine provides 130kW power at 4,000rpm and 350Nm torque at 2,300rpm. The power to weight ratio is 19.42hp/t. The Mercedes Benz W5A-580 automatic transmission has five forward and one reverse gear. 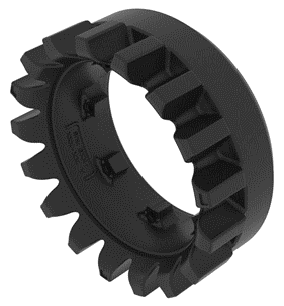 The gearbox is connected by a shaft to a transfer gearbox manufactured by Hagglunds Vehicle AB. A disc brake is installed forward of the transfer gearbox and is protected inside the vehicle body. 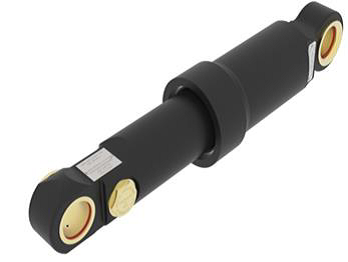 Power is transmitted via cardan shafts to the final drives at the front ends of the forward and rear chassis. The vehicle is equipped with hydrostatic articulated and damped steering. Steering is achieved by a change of direction between the front and rear chassis. The hydraulic system uses commercial off the shelf components. The maximum speed of the Bv206S is 52km/h on a metalled road. The range is up to 300km. The turning radius is 16m. The Bv206S is quickly fitted with a trim vane for fully amphibious capability and is propelled by its tracks. The speed in water is up to 4.7km/h. The vehicle has four-track drive and maintains good mobility on soft surfaces such as mud, sand and snow because the load is distributed evenly over the four tracks, minimising the ground pressure. The tracks are 0.6m wide moulded rubber with cord and the specific ground pressure is 13.4kPa and 13.3kPa for the front and rear cars. The unladen Bv206S can be underslung and air lifted by a Boeing Chinook CH-47 and a Sikorsky Super Stallion CH-53 helicopters. The vehicle is air transportable in the C-5A Galaxy (ten vehicles), C-17A Globemaster (six vehicles), C-130 Hercules (one or two vehicles), C-160 Transall (one vehicle), A400M (two vehicles), CH-47 helicopter (one vehicle) and CH-53 helicopter (one vehicle).